The Price Volume Breakout indicator evaluates the weight of price-volume levels adjacent to the current level and shows a complexly or simple layered vertical histogram and signal line as representation. The Price Volume Breakout indicator is a valuable technical analytical tool which can be used to instantly identify breakouts after the have begun. Realtime display of build up and break down of support and resistance levels using Volume by Price data. 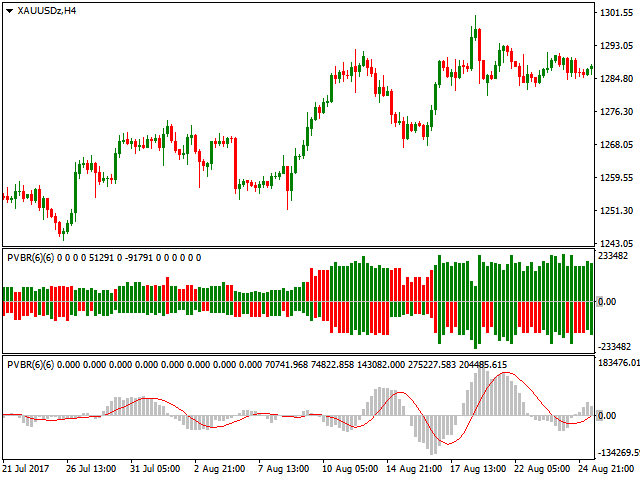 This indicator opens up new perspectives onto price-volume relations. For a list of all features, full parameter specifications, examples and more details about the indicator please refer to the user manual. Sufficient history data. On the price range especially, unavailable, i.e., empty, or newly filled price zones on upper or lower boundary limits provide inaccurate results. 1. ^ For more information about (price-) volume data and native 'Real Volume' availability in terminal refer to "Tick Volume and Real Volume"
Unconventional volume-price indicator. Interesting for predictive analytics. Thanks. Good indicator. Have been using it alot. Thanks for the nice hybrid. Hits them perfect occasionally.